رشیدی, امین, شمالی, ظاهرحسین, کشاورز فرج‌خواه, ناصر. (1397). تحلیل خطر احتمالاتی سونامی در امتداد ساحل جنوب‌شرق ایران. مجله ژئوفیزیک ایران, (), -. امین رشیدی; ظاهرحسین شمالی; ناصر کشاورز فرج‌خواه. "تحلیل خطر احتمالاتی سونامی در امتداد ساحل جنوب‌شرق ایران". مجله ژئوفیزیک ایران, , , 1397, -. رشیدی, امین, شمالی, ظاهرحسین, کشاورز فرج‌خواه, ناصر. (1397). 'تحلیل خطر احتمالاتی سونامی در امتداد ساحل جنوب‌شرق ایران', مجله ژئوفیزیک ایران, (), pp. -. رشیدی, امین, شمالی, ظاهرحسین, کشاورز فرج‌خواه, ناصر. تحلیل خطر احتمالاتی سونامی در امتداد ساحل جنوب‌شرق ایران. مجله ژئوفیزیک ایران, 1397; (): -. علی‌رغم ابهام در رفتار لرزه‌زایی زون فرورانش مکران در ساحل جنوب‌شرق ایران به دلیل لرزه‌خیزی پایین آن، شواهد تاریخی و سونامی سال میلادی 1945 بیان‌کننده پتاسیل سونامی‌زایی این زون می‌باشد. رخداد سونامی‌های محتمل در آینده بیش از هر کشور دیگری، ایران را در معرض خطر ناشی از آن قرار خواهد داد. تحلیل خطر احتمالاتی سونامی راهی موثر برای ارزیابی خطر ناشی از سونامی‌ها و کمک جهت برنامه‌ریزی برای آینده است. در این مطالعه به برآورد خطر احتمالی سونامی در ساحل جنوب‌شرق ایران با در نظر گرفتن زون فرورانش مکران، مکران غربی و مکران شرقی به عنوان چشمه‌های تولیدکننده سونامی پرداخته شد. 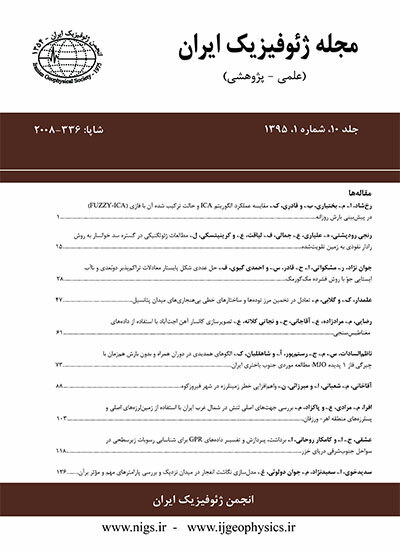 برای مکران‌ غربی و مکران شرقی سناریوهایی برای وقوع زمین لرزه هایی با بزرگی بین 5/7 تا 9/8 و برای کل مکران سناریوهایی با بزرگی‌های بین 5/7 تا 1/9 در نظر گرفته شد. نتایج حاصل از مدلسازی عددی سونامی برای تحلیل خطر احتمالاتی سونامی مورد استفاد قرار گرفت. نتایج به دست آمده ساحل کنارک (در جنوب‌شرق ایران واقع در استان سیستان و بلوچستان) را به عنوان خطرپذیرترین ناحیه ساحلی در میان نقاط مهم مختلف برای سناریوهای مورد مطالعه نشان داد. کمترین خطرپذیری نیز از آن سیریک (در جنوب ایران واقع در استان هرمزگان) می‌باشد. نتایج به دست‌ آمده لزوم توجه به خطر درازمدت سونامی را در این منطقه مهم از کشور ایران به خصوص ناحیه بین جاسک و بریس می‌رساند. Despite the ambiguous tsunmigenic behavior of the Makran Subduction Zone (MSZ), due to the low level of offshore seismicity, historical evidences and the 1945 tsunami in Makran confirm the potential of the MSZ for generating tsunami events. Possible future tsunamis generated by the Makran Subduction Zone will pose the coastlines of Iran to hazard more than any other country. Probabilistic tsunami hazard assessment (PTHA) is an effective approach to assess hazard from tsunamis and help for planning for the future. In this study, we assess the probabilistic tsunami hazard along the southeastern coast of Iran considering the entire Makran, the western Makran and the eastern Makran tsunamigenic sources. Tsunami scenarios include earthquakes of magnitudes between 7.5-8.9 for the western and eastern Makran and between 7.5-9.1 for the entire Makran. Both seismicity and tsunami numerical simulation are inputs for probabilistic hazard analysis. Assuming that the tsunami sources are capable of generating tsunamigenic earthquakes, estimating the annual rate of these events is required for PTHA. The truncated Gutenberg-Richter relation (Cosentino et al., 1977; Weichert, 1980) is used in this study to compute the annual number of the earthquakes. We model tsunamis using the COMCOT well-known algorithm (Liu et al., 1998). The distributions of tsunami heights along the coastline of Iran are used in probabilistic tsunami hazard assessment. The results of PTHA show that Konarak and Sirik coastlines are posed to the most and least hazard from tsunamis. The probability of exceeding (POE) 1 and 3 m increases with time. The probability that tsunami wave height exceeds 3 meters in 500 years is about 0.63 and 0 near the coastlines of Konarak and Sirik, respectively. The maximum POE for 3 m belongs to the area between Beris and the west of Kereti. Distributions of probabilistic tsunami height along the coastline of Iran also indicate that Konarak and Sirik are the most and least vulnerable shorelines to tsunami hazard, respectively. The annual probability of exceeding 1, 2 and 3 m are 1, 0.4 and 0.2 respectively. The results indicate the need of attention to tsunami long-term hazard along the southeastern coast of Iran, especially for the area between Jask and Beris. Our tsunami hazard assessment does not involve the tsunami inundation distances on dry land due to lack of high resolution site-specific bathymetric/topographic maps. Such computations are required in order to estimate the exact impacts of possible future tsunamis on the southeastern coast of Iran. High-resolution hydrographic surveys are required to be done in future for the major ports. Furthermore, future works should consider other possible near-field, such as the Murray Ridge, Minab-Zendan and Sonne faults and far-field tsunami sources, such as the Sumatra-Andaman subduction zone.